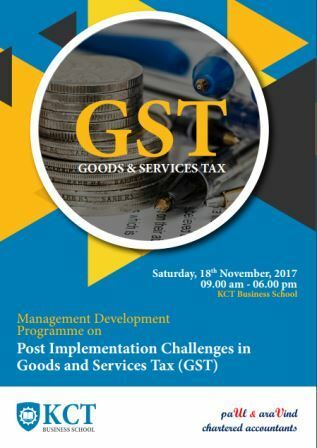 KCT Business School is conducting a Management Development Programme (MDP) on Post implementation Issues and Challenges in Goods and Services Tax (GST) on November 18, 2017 (Saturday) from 09 am – 05.00 pm at KCT Business School, Kumarauguru College of Technology, Coimbatore. The MDP is intended for the practitioners from industry in middle & junior level management, accountants, finance & tax professionals, traders and exporters. The session on GST – post implementation issues will be facilitated by CA. P.PaulThangam & CA. P.AravindThangam, Chartered Accountants and the session on legal issues will be facilitated by Mr.K.Rengaraj & Mr.S.S.Janarthanan, Advocates & Consultants. The registration fee for the programme is Rs.1,500 per participant ( + 18% GST extra) to be paid by draft/cheque favoring “The Correspondent, Kumaraguru College of Technology” payable at Coimbatore. The brochure and registration form are attached.